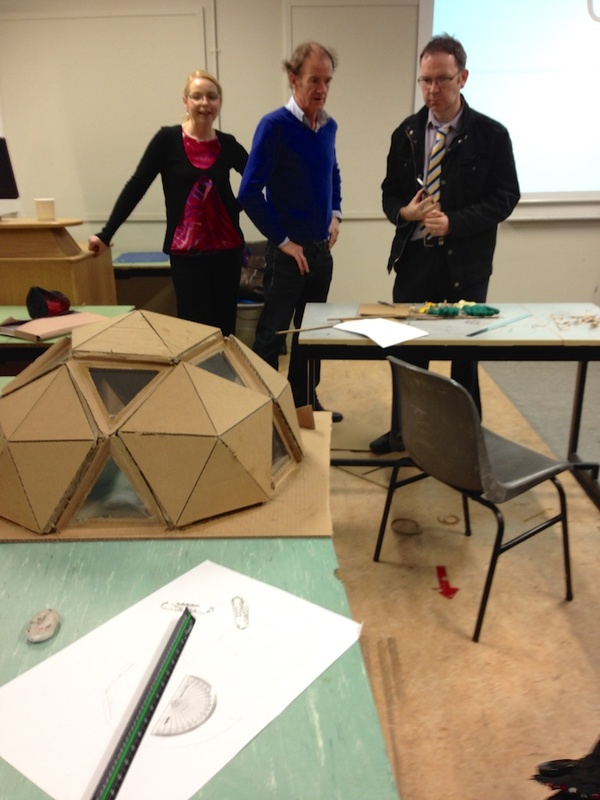 Fionnuala advising an Energy Cube team. Nowadays when you arrive in DIT’s four-year engineering program, you will complete three group-based design projects prior to selecting a specific engineering major: a bridge design project (to familiarize you with civil and structural engineering), a RoboSumo project (to learn about robotics, electrical, and electronic engineering, and programming), and an “Energy Cube” project (as an introduction to mechanical, product, and building services engineering). The Energy Cube project is currently coordinated by a diverse and multi-disciplinary group of teachers. 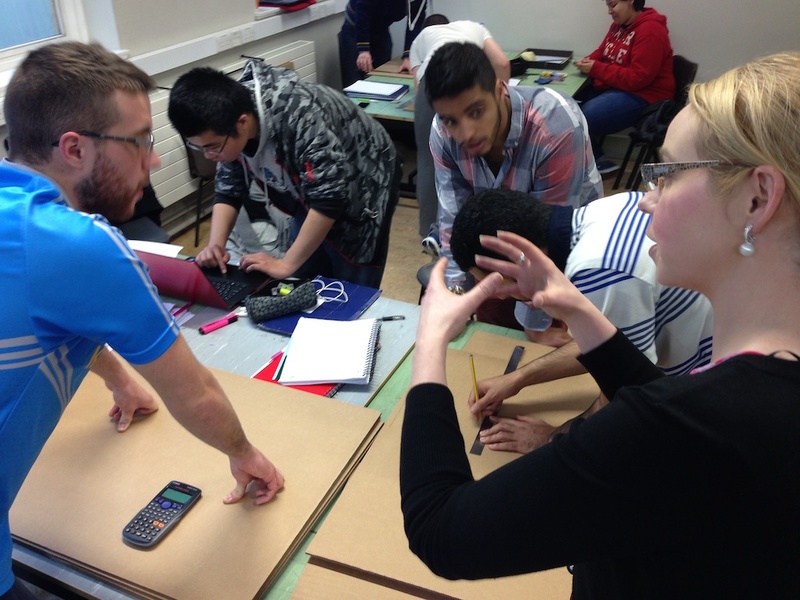 Fionnuala Farrell is a product design and manufacturing engineer, John Nolan is an expert in engineering drawing, and Micheal O’Flaherty is a building services engineer. 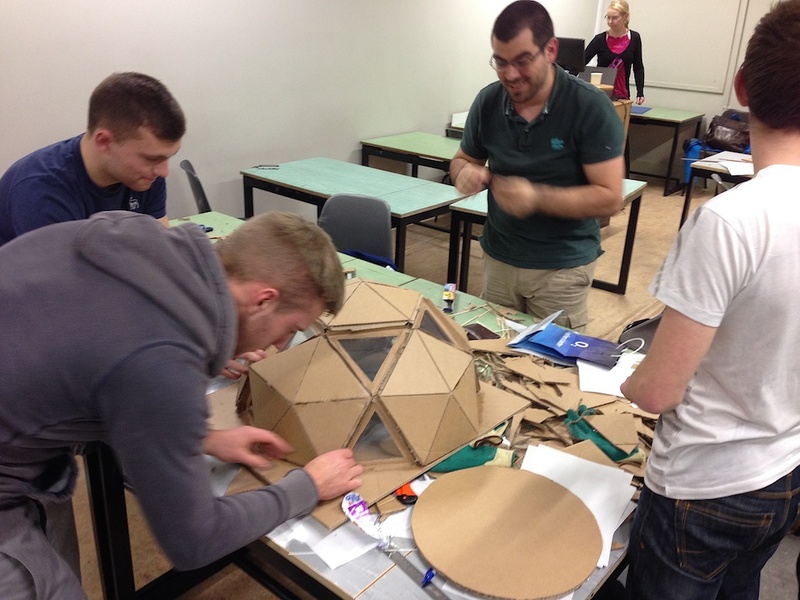 This team built a geodesic dome for their Energy Cube. I’ve been assisting them and contributing the perspective of an architect. I’m not involved in grading, since I’m interviewing some of the students for my research, but I attend classes to better understand what it’s like to learn and teach engineering. Fortunately, I know how to do all the parts involved in this project: designing buildings, identifying client needs, defining product evaluation criteria, collaborating, calculating volumes, making scale translations, predicting thermal performance using mathematical calculations, designing the lighting scheme, building models, testing performance, keeping records, and presenting work in writing as well as verbally. For the students, though, this combination is a tall order! They have a total of six sessions, four hours each (on Friday afternoons!?!!) to design, build, test, and present their Energy Cubes. Whew! Moreover, they are working in assigned (rather than self-selected) groups of four. Learning to work with strangers isn’t always easy. They’ve done an admirable job. Our second of four sets of students will test their cubes later today. I’ve posted photos of what the Energy Cube build looked like last week. What great ways (learning by doing) to help students select the area of engineering they will study. So much more effective than the methods many students may use to choose a specific major. . . friends’ selections . . flipping a coin. . .etc.